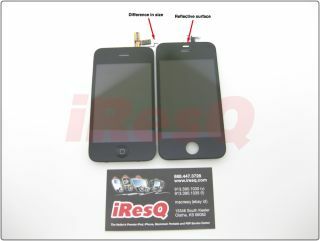 New iPhone 4G to be larger than 3GS? Those looking forward to the iPhone nano will be disappointed to hear that the next Apple mobile might actually be bigger. iPhone repair site iResQ has posted photos of what it 'believes' to be the next case for the fourth-generation iPhone - and it's bigger than the Apple template we've been used to. Admittedly, only quarter of an inch bigger, but it would still be the first time Apple has veered away from the standard iPhone design it's been crafting from since the first mobile it offered in 2007. The pictures also show a reflective panel at the front of the case, which it has been posited might be a proximity sensor - although that doesn't really seem the most likely scenario as it would usually be invisible. We're waiting to hear news of the new 4.0 firmware for the iPhone soon - which should give us more clues about the new treats on offer. iResQ has also said these "may not be the final versions of the chassis" - which we can read as meaning we take this rumour with a huge sack of salt, but it seems we're about to begin iPhone silly season in earnest.